Begin to reframe your viewpoint on sleep. Instead of something that “you have to do,” think of it as something that you get to do. Like when you have some me time and get to take a relaxing bath, or if you have a hot date and you are going out for a nice dinner. Think of that for yourself and sleep. Start letting yourself let go of the stress that usually surrounds sleep and allow your self to actually enjoy it. You work hard enough in your life as it is. You deserve some me time in the form of good sleep. All sunlight is not created equal. Your body clock is most responsive to light between 6:00 a.m. and 8:30 a.m. Exposure to sunlight is beneficial but doesn’t provide the same benefit. Getting direct sunlight outdoors for at least half an hour has been shown to produce the most benefit. If you’re stuck in a cubical dungeon away from natural light at work, you can use your break time to go outside and get some sun on your skin. Even on an overcast day, you will still benefit from the sun’s rays through the clouds. You can also take your 10–15 minute break outdoors or near a window. You can also take lunch outside or take your meetings outside if possible. Remember that your eyes actually play a big role in absorbing sunlight. You absorb sunlight through your optical receptors. So if you have sunglasses on, it can really block the sunlight you need in a healthy way. This is especially true if you are wearing sunglasses that don’t have UV Protection (polarized). In this case, you’re just wearing sunglasses that don’t protect your eyes and are preventing your body from getting the sunlight needed to balance your hormones. Your pupils will actually shrink and protect themselves from getting too much UV light, so it is good to avoid shades in the sun just for fashion’s sake. I get it, your future’s so bright so you have to wear shades, but maybe don’t wear them all the time so you can get what you need of that wonderful sunlight. Don’t expose yourself too much to sunlight only through windows as UVA (ultraviolet) wavelength is the the only type of light that makes it through the windows. UVA is the more harmful light that can cause skin cancer and the like, but direct sunlight contains UVB which is the more valuable type of wavelength of light from the sun that generally helps your body produce vitamin D. When you are in a pinch, such as your dungeon at work doesn’t allow you to get proper sunlight, or it’s winter and you get very little sun exposure, I have provided a list of sleep resources at the end of this section for you to utilize for a happier, healthier you. If you want to get well-rested sleep, make it a mandate to turn off all screens at least 90 minutes before bedtime in order to allow melatonin and cortisol levels to normalize. If you ignore this and continue to have problems sleeping, Netflix is not going to pay your hospital bills. Turn off the cues! Turn off your notifications on your phone, laptop, and iPad. Turn your phone on airplane mode at a specific time before bed so you aren’t tempted to check updates from Instagram, Twitter, and Snapchat. Use a blue light blocker. There are some really cool advancements in technology that has helped with sleep. If you have to work late and get work done, you can get resources that help you not take in so much blue light from your computer. You can find blue light blocker glasses as well here. A study that had participants consume caffeine at different times (immediately before bed, 3 hours before bed, and 6 hours before bed) all showed significant measurable disruptions in their sleep. Those who consumed caffeine 6 hours before bedtime lost 1 hour of sleep shown via sleep monitor. In short, caffeine blocks the receptors that make you feel tired (even if you are tired). And the half life of caffeine is normally 5–8 hours long. So, if you are trying to sleep by 10 pm you know you need to cut that off by 2 pm. Keep things cool. 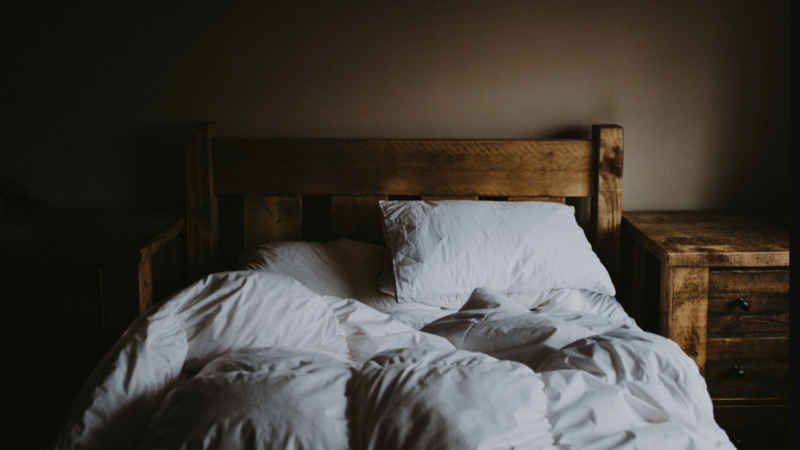 Studies have found that the optimal room temperature for sleep is around 60 to 68 F. Anything too far above or below this range will likely cause some difficulty sleeping. If you have trouble falling asleep, take a war bath 1 1/2 to 2 hours before sleeping. Even though your core temperature will rise during the bath, it will fall when you get out of your bath. Also, if the temp is cold and you usually prefer warmer temperatures, you can rock socks to keep your extremities warm. Sleep during “money time” as Shawn Stephenson coins it. This is during the hours of 10 pm and 2 am. You may be sleeping from 1:00 AM to 9:00 AM and getting 8 hours of sleep, but you are actually missing out on that window of “money time” when the beneficial hormone secretions are at their highest level. Melatonin, human growth hormone (HGH), and more are secreted in their strongest doses when your sleep is lined up properly. Do you want to look younger and vibrant, you need to make sure you’re sleeping during the time your HGH, or “youth hormone” is secreted at its highest level. And that’s between 10 PM and 2 AM. During a normal night of sleep, your body follows a normal sleep cycle. It goes through deep, restorative sleep (deep sleep) and more alert stages (non-REM) and dreaming (REM sleep). These stages of REM and non-REM sleep come together to form a complete cycle. Sleep cycles typically last for 90 minutes each and repeat four to six times per night. So, six normal 90-minute sleep cycles would equal 9 total hours of sleep. Even if you actually sleep throughout the night, you can still wake up a bit groggy if you wake up at the wrong time of your sleep cycle. To help with this issue, you can actually use this sleep cycle app that can be used for android or apple devices and it will monitor your sleep patterns, waking you up gently when you’re on the upswing of your sleep cycle, instead of when you’re in a deep sleep.